Mainstream medicine promotes in large what they want to sell from a fear perspective. They don't sell health. They can't, because they sell little fear pills that have consumers in the billions gobble up out of fear fictitious diseases. 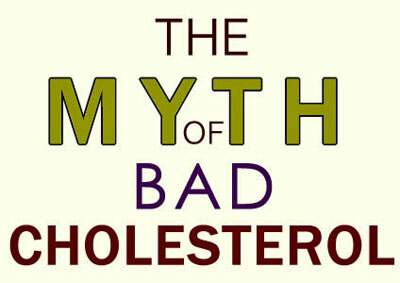 Bad cholesterol is a good example because there is nothing bad about any type of cholesterol. The fact that people with high cholesterol live the longest has already emerged clearly from many scientific papers. Now a University of South Florida professor and an international team of experts have once again found that older people with high levels of a certain type of what is known as bad cholesterol, or low-density lipoprotein (LDL), live as long, and often longer, than their peers with low levels of this same cholesterol. Consider the finding of Dr. Harlan Krumholz of the Department of Cardiovascular Medicine at Yale University, who reported in 1994 in the Journal of the American Medical Association (Lack of Association Between Cholesterol and Coronary Heart Disease Mortality and Morbidity and all-cause Mortality in Persons Older than 70 Years) that old people with low cholesterol died twice as often from a heart attack as did old people with a high cholesterol. Supporters of cholesterol campaigns who routinely provide disinformation about LDL cholesterol consistently ignore this observation, or consider it as a rare exception, produced by chance among a number of studies sponsored by the pharmaceutical industry which have found the opposite. To be more specific, most studies on the elderly have shown that high cholesterol is not a risk factor for coronary heart disease at all. On the Medline database many studies address that question, specifically how 'High Cholesterol may Protect Against Infections and Atherosclerosis'. Dozens of studies have found that high cholesterol does not predict or cause mortality. Now consider that more than 90% of all cardiovascular disease is seen in people above age 60 also and that almost all studies have found that high cholesterol is not a risk factor for women. This means that high cholesterol is only a risk factor for less than 5% of those who die from a heart attack. New findings, which came after analyzing past studies involving more than 68,000 participants over 60 years of age, once again call into question the "cholesterol hypothesis," which previously suggested people with high cholesterol are more at risk of dying and would need statin drugs to lower their cholesterol. Appearing online this month (How Statistical Deception Created the Appearance that Statins are Safe and Effective in Primary and Secondary Prevention of Cardiovascular Disease) in the open access version of the British Medical Journal, the research team's analysis represents the first review of a large group of prior studies on this issue. "We have known for decades that high total cholesterol becomes a much weaker risk for cardiovascular disease with advancing age," said David M. Diamond. "In this analysis, we focused on the so-called 'bad cholesterol' which has been blamed for contributing to heart disease." Subsequently, the research team called for a reevaluation of the need for drugs, such as statins, which are aimed at reducing LDL-C as a step to prevent cardiovascular diseases. David M. Diamond also points out the research that suggests that high cholesterol may be protective against diseases which are common in the elderly. For example, high levels of cholesterol are associated with a lower rate of neurological disorders, such as Parkinson's disease and Alzheimer's disease. Other studies have suggested that high LDL-C may protect against some often fatal diseases, such as cancer and infectious diseases, and that having low LDL-C may increase one's susceptibility to these diseases. "Our results pose several relevant questions for future," said study leader and co-author health researcher Dr. Uffe Ravnskov. "For example, why is total cholesterol a factor for cardiovascular disease for young and middle-age people, but not for the elderly? Why do a substantial number of elderly people with high LDL-C live longer than elderly people with low LDL-C?" Diamond and colleagues have published a number of studies relating to the use and possible misuse of statins for treating cholesterol. Those studies, including their recent paper published in the medical journal Expert Review of Clinical Pharmacology, which demonstrated that the benefits of taking statins have been exaggerated and are misleading. "Our findings provide a contradiction to the cholesterol hypothesis," concluded Diamond. "That hypothesis predicts that cardiovascular disease starts in middle age as a result of high LDL-C cholesterol, worsens with aging, and eventually leads to death from cardiovascular disease. We did not find that trend. If LDL-C is accumulating in arteries over a lifetime to cause heart disease, then why is it that elderly people with the highest LDL-C live the longest? Since people over the age of 60 with high LDL-C live the longest, why should we lower it?"